Treasurer Flowers officially withdraws from Primary after clearing name. To read the complete statement, please click here. On July 30, 2014, Delaware State Treasurer Chip Flowers held a press conference with national and local media to discuss the report issued by the Office of the Auditor of Accounts showing Treasurer Flowers’ travel was for legitimate business purposes and disproving claims and misleading statements issued by his opponent and certain media. Click the following link to view this important press conference and watch our State Treasurer “Stand Up for You”: http://www.youtube.com/watch?v=qoQZhYw1jL4&feature=youtu.be! “Earlier today, the independent Office of the Auditor of Accounts for the State of Delaware released its official audit report (the “Report”) of the State of Delaware’s purchasing card program that focuses on travel and direct reimbursements for appointed and elected officials. The extensive Report verified that Delaware State Treasurer Chip Flowers used the State of Delaware purchase card only for legitimate business expenses and never made any personal charges. The Report is the result of an extensive and conclusive review undertaken by the Office of the Auditor of Accounts on the purchasing card activity of appointed and elected officials, including the Governor, Secretary of Transportation and the State Treasurer. The Report not only supports the Treasury’s and the State Treasurer’s original comments to the public, but it also disproves claims and misleading statements that have been repeated on numerous occasions by certain media sources, including The News Journal. 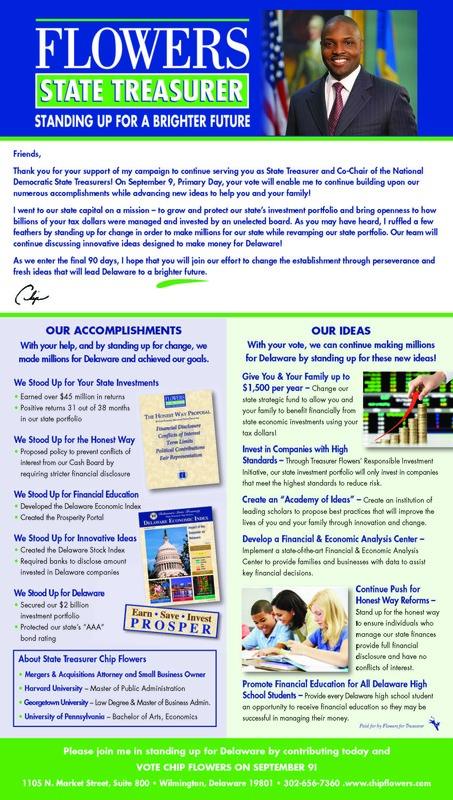 Based on the findings of the Report, the Treasury is warning the public to exercise caution and perform due diligence when reading any information about the Delaware State Treasury and the State Treasurer in The News Journal , as the Treasury believes that information may be presented inaccurately or in a misleading manner in the publication. We encourage the public to read pages 2, 11 & 12. Watch Treasurer Flowers Stand Strong in Debate Against Opponent! “I am truly humbled by the tremendous amount of support and kind words sent to me after the debate with my primary opponent on [last] night. If you have not had an opportunity to watch the debate, I hope that you can find time in your busy schedule to do so. The full debate can be viewed at the following link: https://www.youtube.com/watch?v=qk9K-1q_DVY. We will continue our positive campaign and stand strong against the baseless and negative attacks used by my opponent and those who opposed our efforts that made millions for Delaware! We are working hard every day to earn your vote by advancing ideas and programs that will benefit you, your family and Delaware businesses during my second term. To view image, please click here. The Delaware Economic Index for May 2014 provides key economic and financial data about the First State over the past 60 days. To view the complete Index, please click here. If you have any comments or questions, please do not hesitate to contact your Delaware State Treasury at (302) 672-6700 or visit treasury.delaware.gov. State lawmakers are considering possible reforms for the board that oversees Delaware’s $2 billion cash portfolio. Members of the legislature’s Joint Sunset Committee held a hearing Wednesday regarding issues surrounding the Cash Management Portfolio Board. The nine-member board has been the subject of infighting between elected state treasurer Chip Flowers and other members appointed by the governor. The Sunset Committee periodically reviews state agencies, commissions or boards to determine whether there is still a need for them. Among the reforms it could recommend for the cash management board are financial disclosure requirements for board members, which Flowers has called for. Lawmakers also may look at restricting political contributions from the cash board members, but Flowers’ calls for term limits seemed to get little support among members of the legislative committee. State lawmakers say they will consider new oversight measures suggested by State Treasurer Chip Flowers for the board supervising Delaware’s $2 billion cash portfolio. The Joint Sunset Committee (JSC) held a second hearing on the Cash Management Policy Board Wednesday after the first one last month fell flat, with board chair John Flynn failing to attend and tensions between State Treasurer Chip Flowers and the board blossoming once again. Lawmakers gave the board complete control over the state’s cash portfolio in February. Now, Flowers is lobbying for reforms to the way the entity operates. His proposals include more frequent meetings, adding legislators on the board, and strengthening financial disclosure requirements for members appointed by the governor. After accomplishing nothing in last month’s first attempt to examine those proposals, JSC Co-chair Sen. Nicole Poore (D-12th District) says this meeting went better than she had anticipated. “The state treasurer was able to come up with some ideas that the board is agreeing to and or maybe its always been agreed to. I’m not really sure because we’re not really privy to those meetings. So, in stating that, I think it was much better and we’ll see some successes at the end of this [General Assembly] session,” said Poore. The JSC’s other co-chair, Rep. Gerald Brady (West Wilmington) says the committee is behind increasing financial disclosure, but he doesn’t want to see lawmakers being a part of the body. The committee did not officially act on any proposals at the hearing, but Flowers says he still views it as a positive step. “There is nothing concrete except the fact that we have people on record saying that they’d be supportive of it. Before we had a hearing today, people were opposed to all those concepts. Today, they have a different tune, so that’s one step. We’re moving in the right direction,” said Flowers. JSC will issue their recommendations on changes to the Cash Management Policy Board in May.